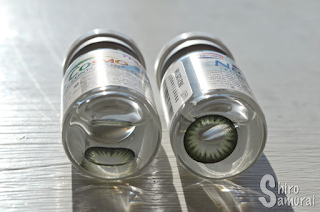 Today I will review the Neo Celeb Green circle lenses, a pair with a smaller diameter than average. 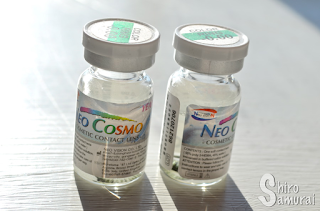 These lenses have a dark limbal ring but are otherwise quite natural! 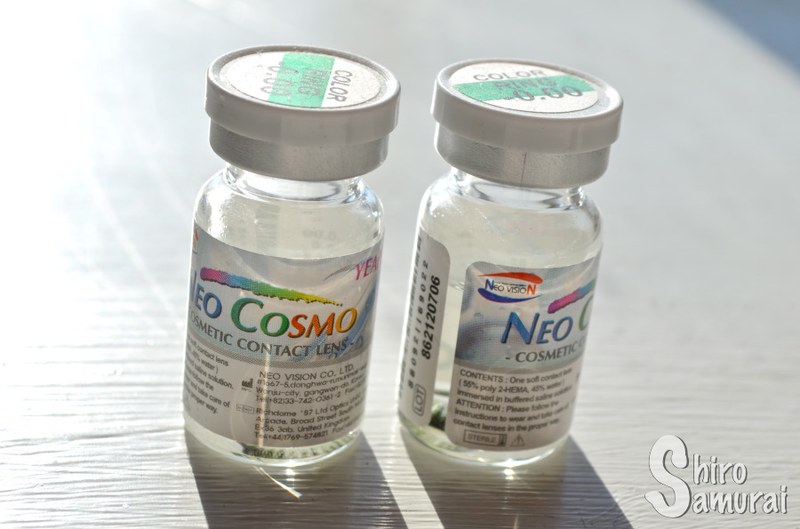 These lenses are made by Neo, also known as Neo Vision and/or Neo Cosmo; I personally prefer to just call them Neo though. These are 2-tone lenses and it's good to know that genuine Neo lenses only come in 14.2 mm diameter – or at least that's what I've read somewhere. When seen from the vials the color looks like some sort of light moss green shade – some would perhaps call it dull or bland. It doesn't seem all that vibrant, nor impressive, but the color is actually quite pleasant once worn. It's a fairly natural green color; it doesn't really 'pop' or anything but it's there. I'd say that it's sophisticated, haha. One lens in. Notice size difference. As you can see the size boost is minimal – I barely noticed the difference when I looked into the mirror with only one lens in and moved my gaze around. 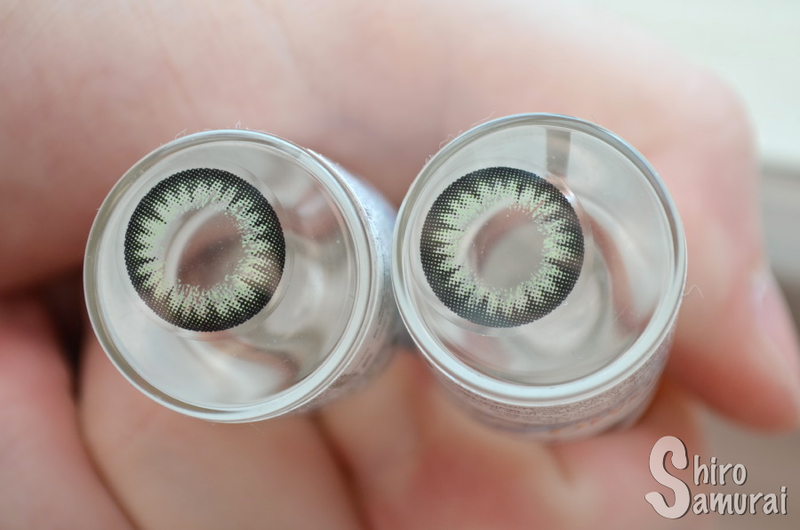 It's a realistic size but the thick black limbal ring will tell everyone that you're wearing colored contact lenses. All photos taken by me during an April afternoon with a clear sky. Facing a window in the corridor. Outdoors, with my back against the sun. Facing wall. The left lens was perfectly fine to wear and, honestly, pretty dang comfortable. I could easily wear it 3+ hours and barely felt it anywhere – no stinginess, teary eyes, redness or anything. It doesn't feel thick in my eye and it's overall really comfy. I'm sure that I could wear it for more than 5 hours if I wanted to. So yeah, if you want small, comfortable and semi-realistic lenses with a notable limbal ring then pick these up! Of course I can't guarantee comfort because everone's eyes are different – but my sensitive and/or dry eyes didn't hate me for wearing these lenses. I've actually had a lot of problems with dry eyes lately so yeah, finding a comfy circle lens pair is getting harder and harder. A light, somewhat muddy green. It's toned down and realistic. Calm and quite pretty in its own way. Simple 2-toned design with a thick black limbal ring. Decent. 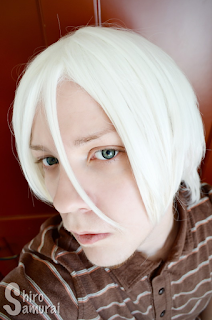 It makes my light blue-gray eyes appear green, although there's a slight blending effect. Quite small. Good for those who don't want big dolly eyes. I can only grade for the non-defective lens, which was more comfy than your average lens. I could wear it over 3 hours with no issues, possibly much longer too. Doesn't feel thick in my eye. Ignore the black limbal ring and these aren't even too shabby in the natural department. Euran mangapäivä 2017 – Plans!